A Project on Pensioners' Portal entrusted to Department of P&PW aims at the welfare of Central Civil Pensioners across the country. Its specific objective is to facilitate redressal of Pensioner's grievances and provide detailed information, guidance etc on pension and other retirement related matters through various stake holders. The project envisages inter-alia association of registered Pensioners' Associations of Central Government Employees and other welfare organizations in the implementation process. Under the above project this Department has already identified 46 Pensioners Associations on the basis of the following criteria. These Associations are given one time hardware /software and Grant-in-Aid up to Rs.75,000/- per annum to participate in the implementation of the scheme to defray expenses on certain approved components such as telephone / internet connection, stationary etc. 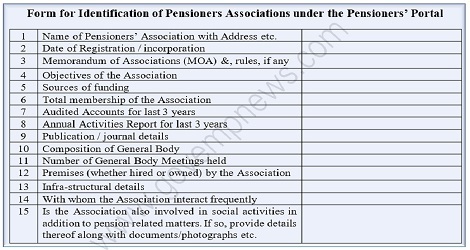 This Department now intends to identify Pensioners Associations in 2017-18 from 11 States and 4 UTs which are Bihar, Chhattisgarh, Telangana, Tripura, Goa, Nagaland, Mizoram, Andaman & Nicobar, Arunachal Pradesh, Meghalaya, Manipur, Sikkim, Daman 81, Diu, Lakshadweep and Dadra & Nagar Haveli looking after the welfare of Civil/ Railways/ Defence pensioners. 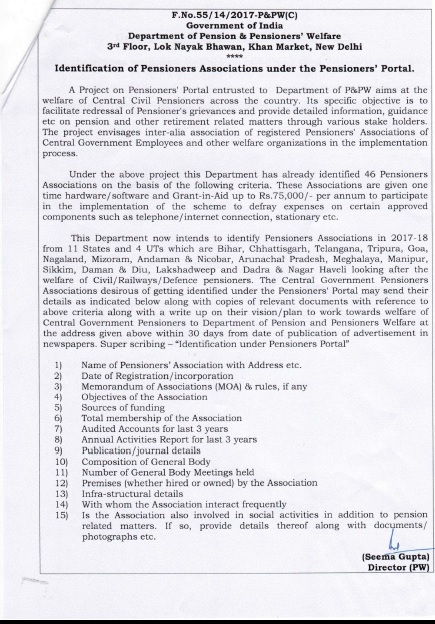 The Central Government Pensioners Associations desirous of getting identified under the Pensioners' Portal may send their details as indicated below along with copies of relevant documents with reference to above criteria along with a write up on their vision / plan to work towards welfare of Central Government Pensioners to Department of Pension and Pensioners Welfare at the address given above within 30 days from date of publication of advertisement in newspapers. Super scribing - “Identification under Pensioners Portal". 1. Name of Pensioners’ Association with Address etc. 15. Is the Association also involved in social activities in addition to pension related matters. If so, provide details thereof along with documents/photographs etc.